posted: March 16, 2018 by: Erin Shea/American Kennel Club Tags: "Clinic Specials" "News"
Prevention is key. While prescription flea and tick preventatives require a trip to your veterinarian, they often offer more convenience and peace-of-mind than over-the-counter options. There are many topical flea and tick prevention treatments available for your dog as well as flea collars that can be convenient since they typically last longer than topical treatment. Talk with your veterinarian to find the best option for your four-legged friend. Actively check your dog. 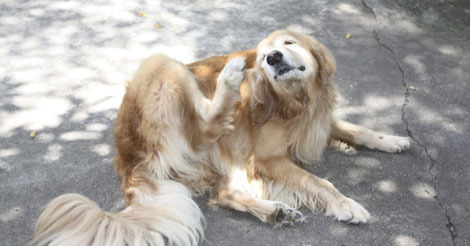 Fleas and itching seem to go hand-in-hand, but you shouldn’t wait until you see your dog scratching to check for fleas. Regularly run a flea comb through his coat and if you find your dog already has a flea and tick infestation, your first step is to eliminate the parasites from your pet. Choose a flea and tick spray to keep adult fleas and ticks off your pup or bathe your dogs with a flea and tick shampoo made to kill these critters. If your dog is outside in wooded areas, check him regularly for ticks and remove any you find right away. Visit your veterinarian immediately if you suspect your dog may have a tick-borne illness. Protect your environment, too. Don’t just check your dog for fleas and ticks, treat his environment as well including your home. In fact, homes are a desirable flea habitat because the fleas are shielded from the outside elements. Also wash your dog’s bedding and vacuum on a regular basis to reduce the number of fleas in your home. Because ticks lurk in grass or low-hanging bushes, keep your yard mowed and trimmed to keep ticks at bay. Prevention all year long. Flea season can run into November or even December, and ticks can become active again as early as February. There is no clear time to start treating your dog. This is why you should consider prevention methods year round to keep your dog safe.